Built around remarkably authentic dramatic reenactments of Jesus' life combined with Frost's incisive biblical commentary, each 12-15 minute episode will peel away our safe and sanitized views of Jesus and reveal the original Jesus of the Gospels. 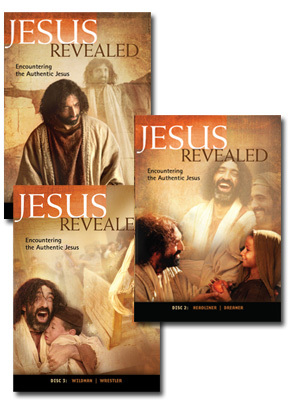 This series is ideal for small group discussion, Christian education classes, high school and college groups. A PDF study guide is included. Episode 1: Underdog (Based on Matthew 4:18-22) - Jesus was born poor and, by some accounts, illegitimate, in a feeding trough, inside a dank barn. When the authorities tried to kill the little boy, the family fled and became asylum-seeking refugees. Jesus was truly an underdog and he chose to associate with other underdogs. In this installment of Jesus Revealed, teacher Andy Frost says, "Coming to terms with the 'underdog Jesus' changes everything about how we see him and how we see ourselves." Episode 2: Revolutionary (Based on Luke 4:14-30, John 2:13-20) - In this installment, Andy Frost asks us to put aside our sanitized views of Jesus the nice guy, and confronts us with the Jesus who turned over tables and screamed against hypocrisy, the Jesus who crossed racial and gender divides and who purposely and publicly broke religious laws. Episode 3: Hero (Based on Matthew 27:24-54) - Jesus is the greatest hero we could ever hope to follow. But this hero is different from the others. His greatest accomplishments appears to be a horrendous defeat. In this installment, Andy Frost takes us inside the brutal reality of Jesus' execution and urges us to see it for what it is: the greatest event in history. Episode 4: Headliner (Based on Matthew 17:1-9) - Christians say that they follow Jesus, but what does that really mean? it's one thing to follow a set of rules or expectations, but Christians are called to follow a person. Who is Jesus to you? Is he a hobby or the focus of your existence, your headliner? In this installment, Andy Frost shows us what happened when Jesus revealed his true glory to some of his disciples. Episode 5: Dreamer (Based on Matthew 5-7) - Jesus was a dreamer. He believed another world was truly possible. And he believed in this dream so deeply that he was willing to pay for it with his life. In this installment, Andy Frost outlines the dream of Jesus as found in his teaching and asks, Do you share his dream? Jesus was anything but predictable. Right from the start – when he was baptized at the River Jordan – he marches off into the wilderness to battle with Satan. This DVD explores the temptations that we face and how we hold onto our identity amidst the trials and the challenges. The call to follow Jesus is anything but safe, we are called to live lives that will not always make sense to the world around us. We are called to be followers of Jesus but that can be difficult. The footprints of the physical Jesus have long since disappeared and instead we often follow a set of rules or spiritual to-do lists. It is time to get back to following Jesus again and to do this we must first grapple to understand the very identity of Jesus.